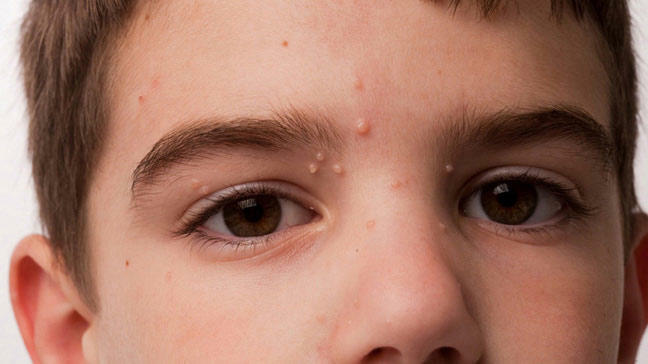 Study Medical Photos: A Child Presents With A Skin Lesion With No Other Associated Symptoms. Discussion: Molluscum contagiosum is a common, superficial viral infection of the skin that typically occurs in infants and preschoolers. The incidence decreases after the age of 6 to 7 years. The condition can be spread via sexual contact in young adults. core and are 1 to 3 mm in diameter. Frequently, groups of lesions are found. The lesions may resolve spontaneously. Treatment involves removal with a sharp needle or curette, application of liquid nitrogen, antiwart preparations, electrodesiccation and curettage, or trichloroacetic peels for extensive areas. Typically, infants or young preschool-age children should not be treated aggressively.